We were delighted to find out this week that Debbie Wake and MyWay Digital Health have been selected as finalists in the Startup Summit competition! The winner is awarded a fully funded place on the Silicon Valley Accelerate programme where entrepreneurs are given an insight into the culture and strategy of some of the world’s most innovative organisations operating out of San Francisco and Silicon Valley. 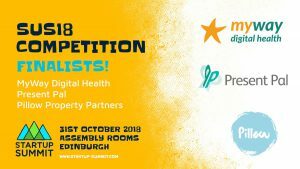 CEO and Chief Medical Officer, Debbie Wake, along with the two other finalists, will be pitching live at the Startup Summit which is taking place in Edinburgh on the 31st of October. To keep up to date with everything in the MyWay Digital Health office then make sure you follow us on all of our social media channels – Twitter, Facebook, Linkedin and Instagram.